Published on January 28, 2010 in Fun Stuff. 0 Comments Tags: Cost Of Happiness, Happiness. WHAT’S a marriage worth? To an Aussie male, about $32,000. That’s the lump sum Professor Paul Frijters says the man would need to receive out of the blue to make him as happy as his marriage will over his lifetime. An Aussie woman would need much less, about $16,000. 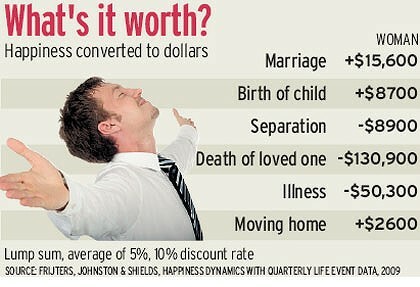 But when it comes to divorce, the Aussie male will be so devastated it would be as if he had lost $110,000. An Aussie woman would be less traumatised, feeling as if she had lost only $9000. Recently named this year’s Best Australian Economist under 40 by the Economic Society of Australia, the Queensland University of Technology professor knows this because he has been mining a unique set of data that has tracked the happiness and major life events of about 10,000 Australians once a year since 2001. ”These are real people to whom unexpected things happen. They weren’t selected because these things would happen, and we can compare their happiness before and after,” Professor Frijters told the Herald after presenting his findings at the Australian National University. Asked to describe how satisfied they are with their lives on a scale of 0 to 10, the Australians surveyed most often use the number eight, but the answers change after (and sometimes in anticipation of) major life events and also after sudden changes in income. That has enabled the professor to put dollar values on the effects on happiness of major events such as marriage, divorce and birth, or as he puts it to calculate their ”psychic costs” or ”psychic benefits”. The birth of a child turns out to bring both. It makes parents the happiest before it happens and then after some months slightly less happy than they would have been without the birth, which is why Professor Frijters puts low dollar values on the lifetime boost to happiness that flows from a birth – for the mother around $8700, for the father $32,600. The death of a spouse or child causes a woman $130,900 worth of grief, according to Frijters’s calculations. It costs a man $627,300. Some of the results fit in with stereotypes. Women get a psychic boost of $2600 from moving house. Men suffer psychic pain of $16,000. Professor Frijters’s dollar figures are lower than those arrived at by other methods. He says that is because he finds that money has a greater effect on happiness than previously thought. ”Losing or gaining money can offset the effect of other life events quite well, and that is what we are formally looking at – the amount needed to offset an event or keep someone happiness-neutral,” he says. Insurance companies and lawyers take a keen interest in the research, he says, because of the need for dollar compensation. Published on January 20, 2010 in Antimimeticisomorphism and Fun Stuff. 0 Comments Tags: Creativity, Imagination, Innovation, Marc-Ka-Ching. Now, 30 years after “2001″ author Arthur C. Clarke wrote about an elevator that rises into outer space, serious research is happening all over the world in an effort to make the far-fetched-sounding idea a reality. 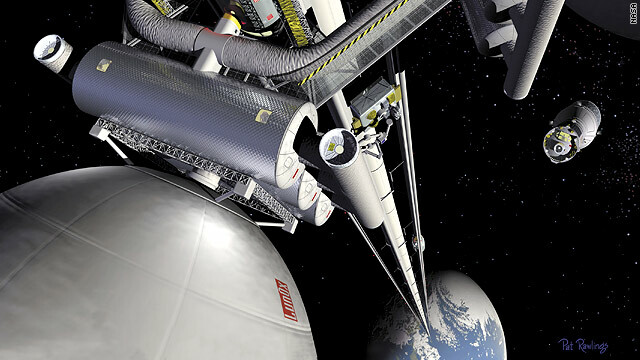 The benefits of a fully realized elevator would make carrying people and goods into space cheaper, easier and safer than with rocket launches, proponents say, opening up a host of possibilities. It sounds like science fiction. And it was. But what does this have to do with Personal Mastery and Exponential Mindset Thinking? Thinking antimimeticisomorphically takes time and practice. With tools like the Marc-Ka-Ching Kube, people can learn to “Twist The Kube”, but in absence of a Kube, how can you learn to as Apple’s 2008 advertising slogan said “Think Different”? It starts by asking and trying to answer questions like this one – it’s stuff of science fiction, but it challenges the intellect AND your sense of adventure and creativity. Try it before you keep reading and try to come up with as many of the challenges and solutions as you can. Go on, don’t cheat, play along – THEN continue reading. Published on January 7, 2010 in Motivation, Positive Thinking, Videos, Vision and Planning and YouTube Videos. 1 Comment Tags: Biography, Inspiration, Stanford University, Steve Jobs. New year, new life, new destiny. But what destiny do you really want? That’s the question Steve Jobs, Apple’s CEO answers with his commencement address at Standford University. It’s worth the 15 minutes to sit back, listen and ponder what you’re doing with yourself and your life in 2010. What I really like about this video is that hindsight is always 20/20, but what if you could have 20/20 foresight? That’s what I teach my clients – 20/20 foresight – to connect the dots as Steve explains, by PLACING them in front of you instead of as a bread crumb trail behind you. It call it the ABCs of Personal Mastery. The sad part is only a very small fraction will actually listen to what he’s saying. If this resonates with you – contact us regarding our Personal Mastery Programs – we’ll help you achieve life balance without compromising your results because YOU CAN HAVE IT ALL. You just need to know what “all is”! Did You Make New Year’s Resolutions For 2010? Published on January 1, 2010 in Fun Stuff and Vision and Planning. 0 Comments Tags: New Year's Resolutions, NYE, Resolutions. I created a quick YES/NO poll on LinkedIn to see how many people actually made the effort to make New Year’s Resolutions for 2010. CLICK HERE to vote in this poll now. That’s it for today. Short and sweet. Vote in the poll now – it’s JUST ONE CLICK.